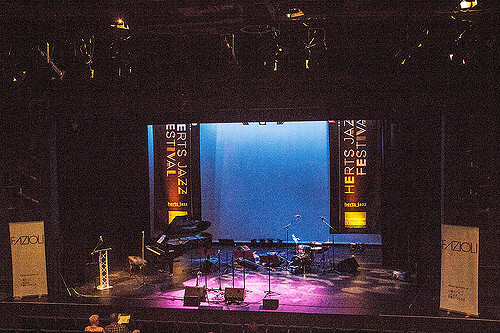 The full programme has just been announced for this year's Herts Jazz Festival, which runs from September 16th to 18th and takes place at the Hawthorne Theatre in Welwyn Garden City. Early bird tickets for the whole weekend are now on sale. These tickets have a designated seat. Booking link below. 11.00-12.30 Late night set – Bryan Spring Trio - FREE! 11.30-12.30 Herts Youth Jazz Ensemble - FREE! 2.00-3.00 In the foyer - Neil Angilley Trio - FREE! 6.15-7.30 In the foyer - Dave Newton/Andy Cleyndert Duo - FREE! 10.30-12.00 Late night set - Introducing Sean Payne - FREE! 2.00-3.00 In the foyer - Nigel Price Organ Trio - FREE! 6.15-7.30 In the foyer - Daniel Casimir Trio - FREE!